It can be hard to make time for each other as life gets busier. You get married, have kids, buy a house, and things just add up. When you do have free time there are a million things to get done. But relationships have to come first. They have to be the foundation for everything else. 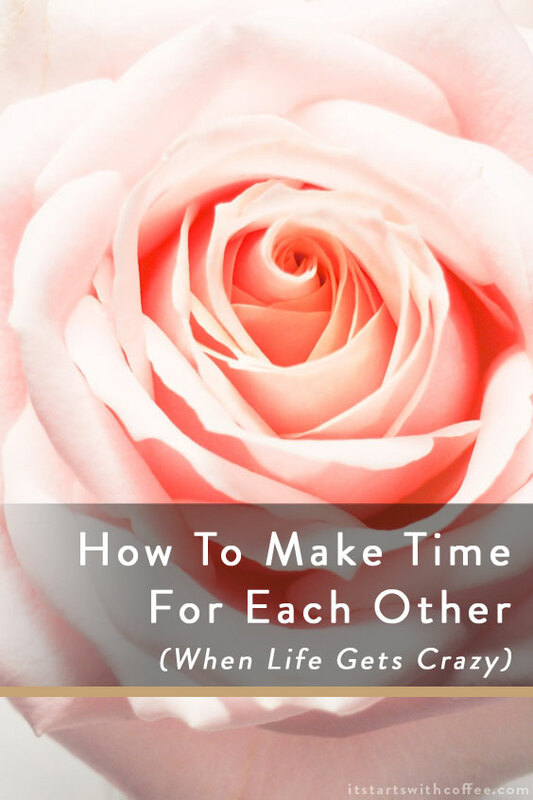 I want to share how to make time for each other when the rest of life can get crazy. Schedule it in: Some people need to schedule their workouts in so there is nothing wrong with scheduling in date nights or time together. We make it a point to put date nights or potential date nights on the calendar. We are far less likely to skip them or cancel them. Unplug: When you are spending time together, put the phones away. This is something we are constantly working on being better at. The social media will always be there. Do a project: Maybe you need to organize a closet, or paint a bedroom or something else around the house. Doing a project together is a great way to spend time as a couple. Take advantage of days off: Andrew works for a bank so he gets bank holidays off! I work for myself so I can take a day off whenever. Recently Andrew had MLK day off and Liam had school so we took advantage of the day off and spent it together! Make vacations a priority: We prioritize one kid free vacation together a year. Last year we went to Florida and this year we are going to Laguna Nigel, California. As much as we love Liam and we miss him so much when we are gone, it’s good for us to reconnect and have that uninterrupted alone time. It’s also good for him to get spoiled by grandparents! At home date nights: When you have kids, an at home date night is sometimes the best you can do. While we make going out on dates a priority it just doesn’t always work. We’ve had to cancel dates because Liam is sick or a babysitter wasn’t available. So cooking a meal together, or even picking up take out is fun. We have done puzzles, watched movies, played games, or just talked. These are just a few examples of how to make time for each other. I would love to know if you have anything you’d add? Life does get crazy sometimes, and we end up not even having time for the people we love. Thanks for the great tips, and the reminder! We struggle with this, mostly because our schedules are so different. But when we do have days/nights off together we make the most of them. And vacations are a MUST. My husband and I both work from home, so it’s pretty easy to “make time” for one another. Although, it has to be after a certain hour cause at times my husband cannot disconnect himself from the business world. My hubby and I definitely take advantage of holidays from work. Our tradition is to decorate our house for Christmas when we have off for Remembrance Day (basically Canadian Veteran’s Day). One of the best pieces of advice I ever heard suggested that the greatest gift you can give your child is a great relationship with your husband (or wife or co-parent). As true now as when I first heard it. My husband and I literally schedule time together into our calendar. Between both of us working for ourselves and two kids at two different schools, plus me doing the yearbook and photography for my oldest son’s elementary school, we are always busy! When my husband and I were both working opposite hours, scheduling time to see each other was so important! I don’t know how people do it consistently but it was worth it for us. You are so right! It’s very important to schedule ahead and make time for each other. I have been struggling wit putting my phone away and living in the moment but I am working on it! One thing my husband and I promised to each other is to take time off for a vacation at least once a year! It’s so important to make time for each other! These are such great tips! SO often, life gets so crazy and before I know it, it has been months since my husband and I had a date night. Scheduling it is a great idea for our family. Oooo great suggestions!!!! I hate that it sounds so in romantic, but hubby and I always schedule time in. Hey, it works! Scheduling it in is essential. I know it doesn’t quite as romantic but the intimacy is important. And you can always be spontaneous within a time frame. Just schedule it. This is something that all marriages and couples seem to struggle with. It is so great when you can make that little bit of time to spend together.